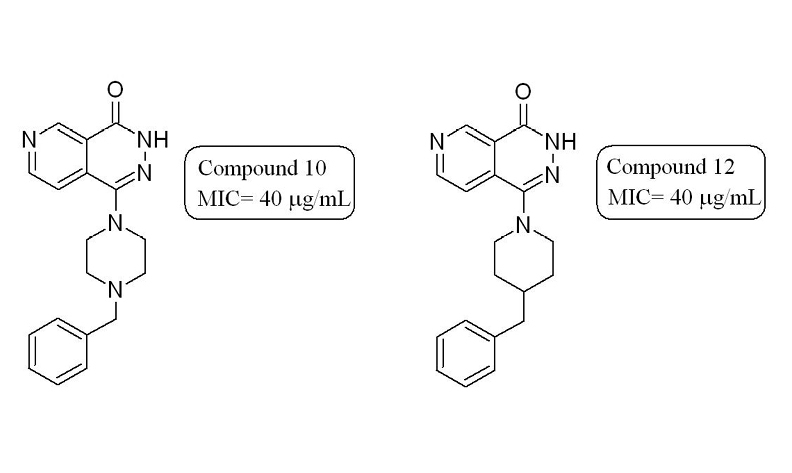 In this study, new pyrido[3,4-d]pyridazine derivatives were synthesized and evaluated for their in vitro antibacterial, antifungal and antimycobacterial activities. Among the synthesized compounds, compound 10 (1-(4-benzylpiperazin-1-yl)pyrido[3,4-d]pyridazin-4(3H)-one) and compound 12 (1-(4-benzylpiperidin-1-yl)pyrido[3,4-d]pyridazin-4(3H)-one) were found to have the highest antimycobacterial activity. However, all compounds were found ineffective against tested Gram-positive, Gram-negative bacteria and fungus.